US President Barack Obama has urged Afghan leader Hamid Karzai to "write a new chapter" in governing Afghanistan, after its disputed presidential poll. Mr Obama said that in a phone call, he had also asked Mr Karzai to intensify efforts to eradicate corruption. He was speaking after the Afghan president had been declared winner of August's fraud-marred election. Earlier, poll officials scrapped a planned run-off following the withdrawal of Mr Karzai's challenger. 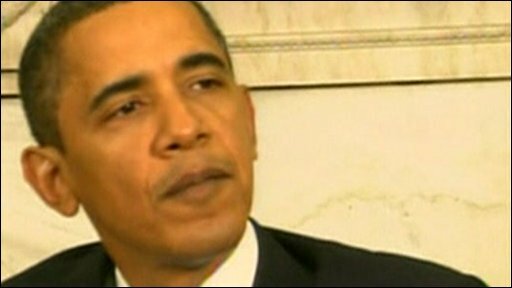 Mr Obama said he had congratulated Mr Karzai on his re-election. He described the poll as "messy", but stressed that the final outcome was "in accordance with Afghan law". Mr Obama said Mr Karzai "assured me that he understood the importance of this moment. But as I indicated to him, the proof is not going to be in words, it's going to be in deeds". The US and British governments let it be known that they regarded the result as legitimate and constitutional and that it reflected the will of the people. Suddenly there was talk that the Afghans did not really want another vote, that they saw it as foreign meddling... However, the praise stopped there. There are conditions attached. The international forces have to be seen as acting in support of the Afghan government and not the other way round. Mr Karzai was declared winner a day after sole challenger Abdullah Abdullah pulled out saying the run-off could not have been free or fair. Mr Abdullah had demanded the removal of key poll officials after the first round, which had been marred by fraud. White House spokesman Robert Gibbs told reporters: "President Karzai has been declared the winner of the Afghan election... So obviously he's the legitimate leader of the country." Earlier on Monday a spokesman for Afghanistan's Independent Election Commission (IEC), Azizullah Lodin, declared that President Karzai, "the only candidate for the second round", had been "elected president of Afghanistan". He said the second round, scheduled for 7 November, was being scrapped to save money and for security reasons. The Taliban, which carried out attacks across the country during the first round, had vowed to disrupt the polls again next Saturday. President Karzai - who was first elected Afghan president in 2004 - had been the favourite to win another five-year term in the run-off. One of the reasons for holding a deciding vote had been to try to restore some legitimacy to the process, after the discredited first round on 20 August. A number of international figures, including US Senator John Kerry, US Secretary of State Hillary Clinton and UK Prime Minister Gordon Brown, had been involved in persuading Mr Karzai to accept a run-off. However, Mr Brown on Monday said he welcomed the commission's decision. A spokesman said the PM had "spoken to President Karzai to congratulate him on his re-election" and the two men had "discussed the importance of the president moving quickly to set out a unifying programme for the future of Afghanistan". 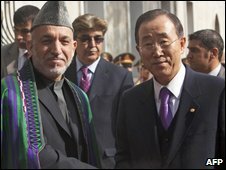 UN Secretary General Ban Ki-moon, who is in Kabul, also congratulated Mr Karzai. He said Afghanistan's troubled election had been among "the most difficult the United Nations has ever supported". The BBC's Lyse Doucet in Kabul says there had been intense discussion in recent days as to whether scrapping the second round would be constitutionally legal. Some observers are saying Mr Karzai's legitimacy is also in question, and ask whether his government can be effective, adds our correspondent. This would be a particular concern to President Obama as he considers whether to send up to 40,000 more troops to Afghanistan. Hundreds of thousands of votes were discounted from August's first round, including almost a third of ballots cast for Mr Karzai. The incumbent's share of the vote was cut to just under the crucial 50% plus one ballot threshold needed for outright victory, following an investigation by the UN-backed Electoral Complaints Commission. Mr Abdullah had demanded key officials be removed from the IEC, which is widely regarded as pro-Karzai, ahead of any run-off vote. A Tajik-Pashtun former eye surgeon and ex-foreign minister, Mr Abdullah was judged in the end to have won nearly a third of valid votes cast. West seeks new beginnings from Hamid Karzai, writes Lyse Doucet.